Statement from Dr. John Duke Anthony, Founding President and CEO, National Council on U.S.-Arab Relations; Member, Secretary of State Kerry’s Advisory Committee on International Economic Policy and its Subcommittee on Sanctions; and Adjunct Professor, Defense Institute of Security Assistance Management; on occasion of the C3 Summit 2013 in New York. Wael Fakharany, Ransel Potter, and other distinguished speakers and guests, I am honored to have been asked once again to address you at this second annual C3 Summit in New York. I am also pleased to be asked to identify an opportunity largely overlooked by the rest of the world and especially by many in the United States that will continue to have an extraordinary impact on global affairs. Such an opportunity is the little known but growing and increasingly formalized American relationship with the six Gulf Cooperation Council (GCC) member-countries of Bahrain, Kuwait, Oman, Qatar, Saudi Arabia, and the United Arab Emirates. The GCC and its members arguably represented such an opportunity from the beginning of its establishment in May 1981. Certainly, the region they inhabit then as now is the one area more than any other on the planet to which the United States has mobilized, deployed, and led an internationally concerted coalition of the world’s armed forces three times in the last quarter century. Even so, and despite the GCC countries wishing it were otherwise from the outset, and despite also the European Union (EU) and its member countries taking advantage of the opportunity practically from the beginning, often at America’s expense despite the latter’s economic and strategic comparative advantage, the United States mainly failed to do so. Instead, for reasons arguably anchored in the deep-rooted and pervasive American negative stereotypes of Arabs and Muslims, and an undeclared suspicion of the potentially controversial use to which the extraordinary resources of such a collectivity might one day be put, one set of American Executive and Legislative Branch leaders after another paid little heed to the Riyadh-based GCC General Secretariat. Neither did Washington officialdom take seriously or respond credibly and respectfully to the members’ various overtures to try and place their relationship with world’s strongest power, and vice versa, on the firmest foundation possible. Now, however, this has largely changed. At least on the economic and strategic fronts as they relate to America’s and the GCC’s respective quests for greater regional and global security and stability, and the respective potential for increased prosperity at both ends of the relationship, there is the end of an error and the beginning of an era quite unlike any before. The turning point in this regard occurred in October 2008, when the impending U.S.–housing market insecure mortgages-induced global international economic, financial, credit, and liquidity crisis ensued. This writer was in the region then immediately after the little publicized but highly significant official visit to four GCC countries by the then-Assistant Secretary of the Treasury. With a metaphorical begging bowl in hand, the official’s purpose was to request, in effect, what the United States had so frequently and successfully requested in times of earlier major economic need: various kinds of thinly disguised economic bailouts to tide the world’s largest but also most indebted economy over for what inevitably turned out to be the next crisis or moment of extraordinary official American material aid. But while the American envoy was received cordially and respectfully, in keeping with the norms and rituals of pan-GCC respect and custom, the nature of his reception was in another way profoundly different. In effect, one after the other GCC country official indicated that no longer would their ministries of finance and economy be as willing as before to come to the rescue of an impending American fiscal, monetary, or other debt-related predicament. This time, and from then on, they demanded practically in unison that if they were to extend anywhere near the massive nature and degree of assistance requested as before, they would provide serious and favorable consideration to doing so this time only if they were figuratively speaking present if not also on board not only on the crash landing but also on the takeoff. Thus was born the formation of an entirely new global economic grouping: the G-20. 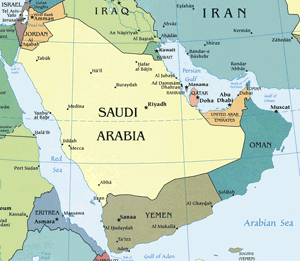 The United States and eighteen other countries thereby agreed that Saudi Arabia would be a founding member. Not only that, but the founders also agreed unanimously that, in addition to the kingdom representing itself, it would also represent the five other GCC countries combined. As the saying goes, little has been the same since. Beginning in March 2012, at a meeting in Riyadh and building on the already extant years-old Saudi Arabian-U.S. annual rounds of several simultaneous strategic dialogues, there have now been three U.S.-GCC strategic dialogues. Each has covered practically every major aspect of their respective concerns with security and stability as well as areas of mutual economic concern. The third meeting of the U.S.-GCC Strategic Cooperation Forum, which was closed to the public and attended by GCC Foreign Ministers, GCC Secretary General Dr. Abdul Latif Bin Rashid Al Zayani, U.S. Secretary of State John Kerry, and U.S. Secretary of Defense Chuck Hagel, was recently held in New York on September 26, 2013. As expected and in keeping with mutual agreement between the parties beforehand, the meeting reviewed progress in all areas under the forum’s mandate: political, military, security, economic, and more. Not surprisingly, Syria was also a major focus of the meeting, with GCC and official American representatives present sharing the position that the Assad regime should have no place in a transitional or future Syrian government. This third meeting represented another significant step toward placing the relationship between the United States, the GCC, and its members on a more solid and enduring foundation. In remarks to C3 founding organizer Ransel Potter on the eve of this year’s annual conference, I noted, “It is hard for many to imagine another sub-regional organization, this one geographically significantly larger than all of Western Europe combined — and possessor of nearly half the planet’s known energy resources that drive the engine of practically every country’s economy — with such an outsized regional and global reach. “The evidence to hand: its internationally-oriented policies and positions, its actions and attitudes regarding its members and billions of other people’s issues and their legitimate needs, concerns, interests, together with their respective national development processes as well as key foreign policy objectives. 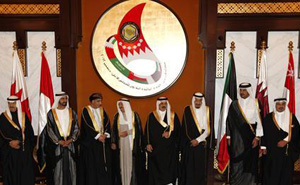 Gulf Cooperation Council (GCC) leaders during their annual summit meeting in Manama, Bahrain, in December 2012. “Lest one regard the GCC as a still evolving and relatively insignificant entity when it comes to major matters of importance and interest to the world,” I offered, “One need only ponder the following. “In 2011, in cooperation with the League of Arab States, the United States, and NATO, the GCC played a formidable transitional role in the situation in Libya. Member state Qatar sent its entire air force to refueling stations offshore Libya to assist in NATO aircraft operations. In addition, it integrated Libya’s continuing oil production into its own oil export markets and funded the transitional government throughout the fighting. “In the same year, armed forces units of GCC members Saudi Arabia and the UAE responded to Bahrain’s appeal for their assistance in suppressing a series of peaceful protests turned violent. Contingents of their respective armed forces and police immediately arrived to the island state to protect its economic and industrial infrastructure from attack and sabotage. “Earlier this year, GCC members Kuwait, Saudi Arabia, and the UAE, alone among the world’s nations, deposited 12 billion dollars in the Egyptian government’s account in economic stabilization support, enough to cover an entire year of the country’s external payments. In addition, they and Qatar pledged billions more in humanitarian aid and developmental assistance to Egypt’s massively impoverished people. “In between, in 2012,” I added, “GCC Secretary General Dr. Abdul Latif Bin Rashid Al Zayani played a key role in brokering the peaceful transition in Yemen’s presidential power.